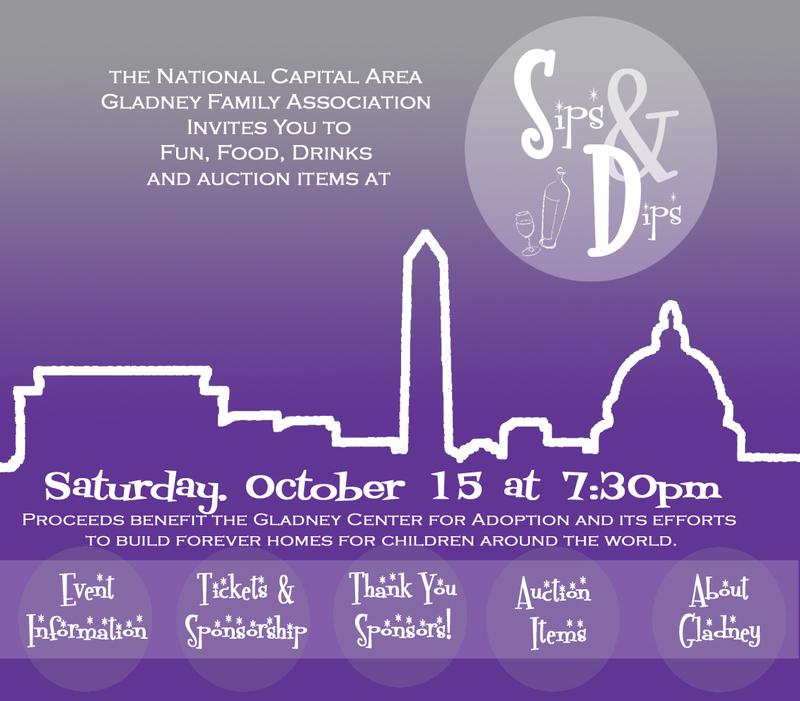 Please join the National Capital Area Gladney Family Association for a fun filled evening of sips (fabulous wines) and dips (along with other delicious assorted hors d’oeuvres). Enjoy a “capitol” view from the heart of downtown DC as you mingle and bid among our amazing silent auction items, all to benefit the Gladney Center for Adoption and its efforts to find forever homes for children around the world. (Click HERE if you cannot attend but would like to make a donation instead). Location: The law offices of Jones Day, 300 New Jersey Avenue NW, Washington DC. Parking: Underground parking is available in the building and the entrance is near the intersection of 1st and D Streets NW (on 1st Street). The garage elevators take you to the Atrium level. If you do not park in the building, the main entrance is at 300 New Jersey Avenue, NW. When you reach the atrium lobby, you will be escorted to the event by Jones Day staff. RSVP: by October 10 to Nicole Walters at Nicole.W.Walters@gmail.com or by registering online. If you are unable to attend but would like to make a donation, please contact Nicole Walters at Nicole.W.Walters@gmail.com.